The pictures just don’t do justice with how delicious this dish tasted; highly recommended! Wine Suggestion: Try complementing the smoky fish with an oaked white such as a New World Chardonnay. Put the cream in a shallow pan. Add the haddock, peppercorns and bay leaves. Bring to the boil, then turn off and cover with a lid. Melt the butter in a saucepan over a moderate heat. Cook the carrot and onion in the butter for about 5 minutes, then add the lentils and vegetable stock. Bring to the boil, then turn the heat down and simmer for about 20 minutes or until the lentils are almost soft, then stir in the cream from the fish. Continue cooking until the liquid has reduced to just cover the lentils. Add the parsley and season. 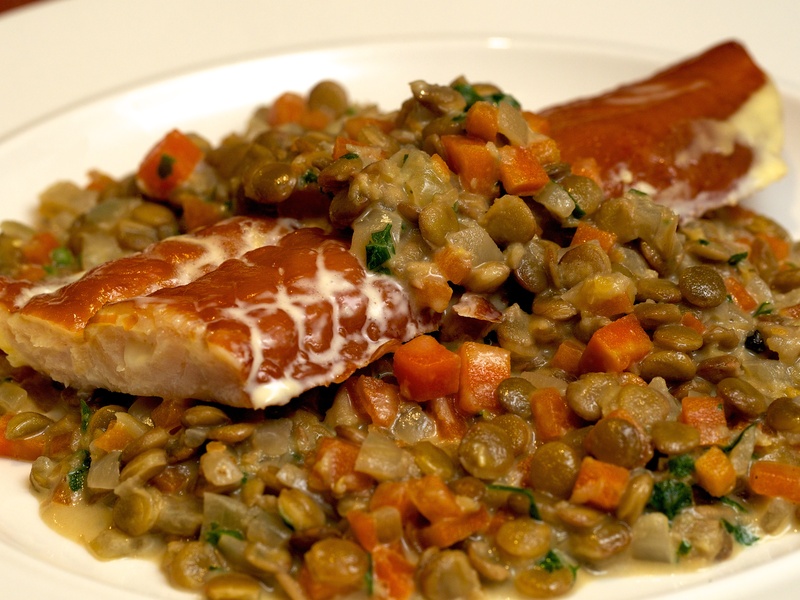 Divide the lentils between two dishes and serve the haddock on top. Absolutely love this recipe. Great cookbook too.